(60) longing for wholeness – walking forward. I think at times when I feel too much longing, I stop writing for a while. This doesn’t make sense, really. Maybe I’ve postponed writing because of all the time I’ve spent in front of a computer screen, typing for others, hoping to rack up enough lines to make a decent income, propping sore wrists in a supportive manner, escaping from the computer to the garden, only to come back for an episode of Friends or Battlestar Galactica. Or maybe I just stop writing because I do that sometimes when I feel too much longing. Life feels deep. Complex. Painful. Sweet. Textured and multidimensional. Rhythmic. Cyclical. About as difficult as a 1,000-feet-of-altitude-gain-per-mile hike. About as simple as the toothlessly charming, slightly askew, wordlessly eloquent grin of a wee baby girl. Sometimes I feel I cannot bear another moment of this bittersweetness. And yet the moments tumble on, one after another. So much routine, so many unanswerable questions, so much silence, so many words, such delight, such sorrow. And I am hardly keeping up, barely aware of who I might be while carried in this torrent. And I ache with longing. 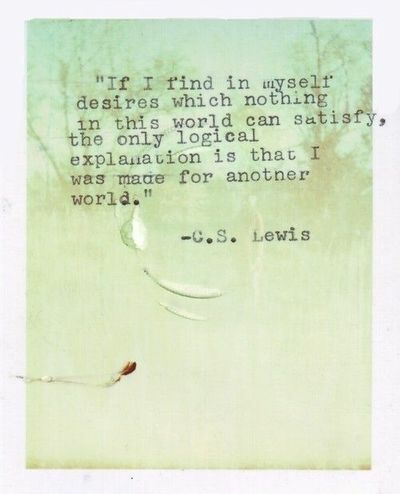 This C. S. Lewis quote resurfaced for me tonight as she and I talked about what a loss it is to only be in a single place at once. I’ve only lived a few years longer than she, but I tell her what I’ve noticed so far: With the sweet, comes the bitter. With the hello, a goodbye. With the yes, a no. To me, this rhythm has been inescapable. The foremost example right now is deeply personal: I’m given the precious gift of closeness with her, with her family, at the extraordinary cost of living far away from him, that sweet man who I love so dearly. I realize that maybe this is a common thread through the wonderings and conversations and silence of the past days, weeks. I long for restoration in fractured relationships. I long for wholeness and freedom and space — open space even bigger than Texas — in my heart, in my mind. I long for oneness and a knitting-together of soul in marriage. I long for healing and justice and hope and laughter. Maybe all of this simply points to another place, the place where my heart is truly at home. This entry was posted in Church/Faith, Just write and tagged day's end, emotion, identity, Reflection. Bookmark the permalink.